The entire line PIXIS™ is a gem of innovation and ingenuity, very small butsturdy and easy-to-use. The mini LED spotlight has a magnetically assembled head which handles field-interchangeable optics of 18°, 24° and 41°. Completely independent from one another, each head can be fully rotated horizontally and allows for an 80° pivoting angle for maximum light control. PIXIS™ STEM version for small retail showcase is designed to provide focus illumination in many merchandising applications. 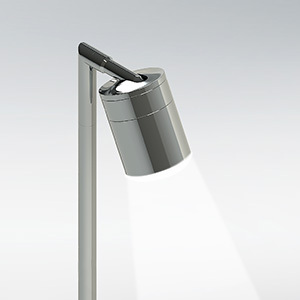 Compact in design but big in light it’s ideal for application requiring small yet precise lighting solution. Made-to-measure the height is adjustable up to 18 inches and comes with one or two heads, each stem is independent and spins freely. Cold roll steel lens holder and arm. Brass stem. High precision machined construction integrated heatsink. Field changeable optics.